Stadium Financing $76.5 million by Steelers. Naming Rights H.J. Heinz Company paid $57 million over 20 years. The Team Marketing Report FCI includes: four average-price tickets; four small soft drinks; two small beers; four hot dogs; two game programs; parking; and two adult-size caps. 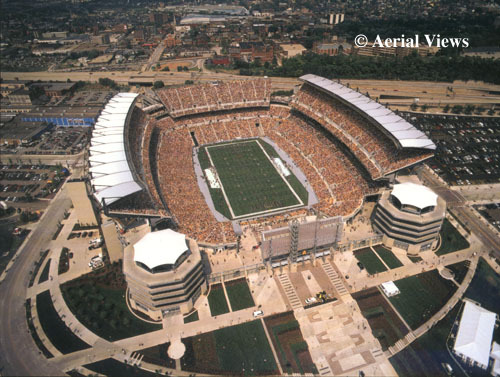 1993-2000 - Attendance at Three Rivers Stadium, Pittsburgh, PA.
PITTSBURGH (June 1999) The design for the Steelers new football stadium is nearly complete, and the team is prepared to give the public its first glimpse of what is expected to be one of the most spectacular football stadiums ever built. Sketches for the 65,000-seat Steelers stadium were unveiled today at a press conference at Steelers headquarters at Three Rivers Stadium. "We have worked hard to design a spectacular football stadium for our fans, one of which they will be proud and can enjoy for years to come," said Steelers vice president Arthur J. Rooney II. "In addition to being a great stadium for fans to watch football, we wanted the design to be distinctively Pittsburgh. We believe the current design accomplishes both objectives." There will be many improvements in the new stadium compared to Three Rivers Stadium, according to Rooney, including many more seats on the lower level and along the sidelines, wider concourses, a greater number of restrooms, and a state-of-the-art scoreboard and sound system. The new stadium will feature an open end at the south end zone, which will be accented by two towers and a plaza area providing vistas of the Point and Downtown. The plaza area allows the city to become a part of the stadium and game-day experience. The plaza and park are conceived of as an inviting public space that connects to the riverfront. Likewise, the south end zone towers and plaza will provide a dramatic new addition to the Northshore riverfront, which will be visible from Downtown, Point Park and Mt. Washington. The towers will be themed to represent both the industrial heritage of Pittsburgh and its future. Circulating throughout the towers will be interactive attractions in which fans can participate and enjoy. In addition to football games, the facility will accommodate concerts and large public events. Another unique feature of the stadium will be the eastside concourse, which will be called "The Great Hall" and be themed around the Steelers, Pittsburgh Panthers and Western Pennsylvania football traditions. This area will contain a retail/entertainment component that can operate throughout the year and is accessible from outside and inside the stadium. This eastside location allows the retail area to function as a main entry facing future North Shore developments and Downtown. Elements such as a Steelers Store, Hall of Fame and/or theater, retail, restaurants, or other entertainment activities may be located in the area. Anchored to the ground by a solid mass, conveying an image of strength and permanence, the stadium will gradually become more transparent as it progresses vertically to the facade. Forms and materials appear lighter, and there are more openings in the structure. Spectators and activities on the upper concourses will be visible from outside the stadium, and those spectators will have views of downtown and the surrounding areas. Steel will be a primary structural building material, incorporated as a contemporary expression of Pittsburgh. The stadium will have a roof structure over the upper seating bowl, and some administrative functions will be housed at the facility full-time, including the ticket and marketing operations. Number of Club Lounges: One on each end of the east and west sidelines, each designed as a three story atrium space with a large bar, beverage kiosks, specialty food stands and a video wall. Opportunities exist to convert the lounge into banquet space for large or small gatherings. Follow I-279 South to the North Shore Exit (Heinz Field/PNC Park). Follow Reedsdale to the second traffic light and make left onto Allegheny Avenue and follow North Shore Drive, which circles Heinz Field. Take the Monroeville Exit- head toward Pittsburgh. You will be on I - 376. Follow I-376 to North Shore ramp onto Fort Duquesne Boulevard. Keep to the left and merge left to cross Fort Duquesne Bridge. Exit to left (EXIT 7A) after crossing bridge and turn left onto Allegheny Avenue and follow North Shore Drive, which circles Heinz Field. October 29, 2001 - Along with PNC Park, Heinz Field in Pittsburgh is the newest addition to the bustling Pittsburgh skyline, and what an addition it is! After playing for over three decades at Three Rivers Stadium, the Steelers followed the trend among their peer NFL teams in erecting a new venue with all the bells and whistles, amenities, club seating, and judging from our visit, they got it right! Opened just two months ago, Heinz Field now serves as the home stadium for the Steelers as well as the University of Pittsburgh Panthers football team. Heinz Field is located along the Ohio River on the riverfront, just a few hundred yards from the doorstep of PNC Park and directly across the river is the magnificent Pittsburgh skyline. Separating the two new venues is the site where Three Rivers once stood, now demolished and turned into parking, although some parcels are part of the "North Shore" development which will include an amphitheatre and office park. The land adjacent to the river has already been developed into a pleasant riverwalk and attractive parklike setting. We had to search hard to find fault with Heinz Field, but the one and only criticism would be the difficult parking situation. Following the trend in newer NFL venues, the surface parking immediately around the stadium is sold to season ticket holders. Gold parking, platinum parking, yadda yadda.... if the face value of your ticket breaks three figures, you get the chance to buy a space closer to the building. Own a suite? Parking and a shoe shine! Just kidding here, but again, the single ticket buyer is left to fend for himself. In proximity to the stadium are many private surface lots, but many of those have been scooped up by a municipal parking authority, and even these lots are sold on a season ticket basis. So what is a person to do? Our advice - get down real early (we arrived 4 hours before kickoff to tailgate and hang out with Steeler fans and found a private lot real close - $20 to park). Or park downtown and cross the Clemente Bridge, but that is a long, long walk. Or park at Station Square, and catch the Clipper ferry boat, which docks steps from the Gate A main entrance to Heinz Field. To the Steelers credit, they are well aware of the parking crunch, and publish maps of parking lots, traffic patterns, and an elaborate guide laying out parking options and strategies to get their fans to the stadium. Tailgating is a great Pittsburgh tradition, and on past visits here we were impressed to see the folks tailgating here for Pirates baseball games. So no doubt that the grills were in abundance, the Iron City Beer on ice, stereos blaring, and fans out here just having a great time. Here in a downtown setting, in the shadows of the skyline these Steelers fans can tailgate with the best of them! Heinz Field itself is configured in the shape of the horseshoe, with the south end completely open except for a large scoreboard. This does two things - from the outside the open end serves as a main entrance, with a massive public plaza both outside and inside the gates and a grand staircase leading down to the riverwalk and the ferry dock. All handsomely landscaped and very appealing to the eye, of course. From the inside, fans sitting in their seats are treated to a spectacular view of the river and downtown Pittsburgh. OK, here is where things get really good. The Steelers have done an outstanding job erecting public spaces which are large, wide and functional. Walking through gate A you stand in a gigantic public plaza in the south end zone with a nice view of the field. On either side are circular canopied ramps to take you upstairs, mimicking the architecture of similar type ramps over at PNC Park. In the center of these curly ramps are escalator towers to whisk you upstairs. The sideline concourses are also wide, brightly lit, and easy to navigate, with points of sale strategically placed so as not to impede traffic. It was the east concourse on the main level, named the "Coca Cola Great Hall", which just totally blew us away in terms of its architecture, ambience, lighting and displays. We will try to describe it for you here, but we have to advise you to go see this for yourself. The Coca Cola Great Hall straddles the 100 level concourse on the east side of stadium, and ceiling canopies and banners way up high are colored in bright reds, oranges and yellows, with mood lighting adding to the effect. Four of the center posts are shaped as massive Vince Lombardi trophies, and each one of these posts have showcases displaying the actual trophies and memorabilia commemorating the Steelers four world championships. Large murals hang overhead with faces of Steelers greats and great moments in the teams history. Keep looking and you will find old photos of Pittsburgh streetscapes, industry, downtown shots, Forbes Field. And yes, there is space devoted to Pitt Panthers memorabilia as well. We're certain that the names of Marino and Dorsett ring a bell along with the legacy of nine national titles. Heard enough? There's more... Near the fifty yard line is a three tiered bleacher area configured in a semi circle, centered by a stage where pre game entertainment is offered. Adjacent is a large bar area and sandwich carving station, and of course concession areas offering a multitude of food choices adds to the mix. TV monitors are everywhere, so you don't miss a second of the action. What a totally amazing, mind blowing public space in a football venue!!! Easily the best we have seen. Of course we headed down from our seats mid 2nd quarter to grab a Primanti sandwich, found seats in the bleachers and just enjoyed our food and people watching right through halftime. We could not get enough of soaking in the atmosphere and the ambience! As is the case with today's NFL venues, Heinz Field offers a 200 level along the sidelines with its own private, climate enclosed concourse. Two levels of suites top the club level, each with its own concourse. To give you an idea of prices, some fans we hung out with before the game had club tickets --- face value, $195. And these weren't even the top priced seats!!! Digest that, oh Buffalo fan! With about 65,000 total seats, the seating bowl is broken into three levels. All seats are done in team colors - lower and upper level seats bright yellow, and the club seats black. Straddling the sideline balconies are synchronized changable ad panels, while the north end zone balcony boasts our favorite - a digital LED ad panel with great graphics and special effects. In the south end zone is a huge jumbotron scoreboard. Here in Pittsburgh they only have one scoreboard, rather than the two boards which are going up in venues elsewhere. But mind you, there are hardly any seats at all in this end zone, so the one scoreboard can be easily viewed from just about every seat in the venue. We should also mention that atop the jumbotron board are two large bottles of "Heinz" ketchup. Each time the home team enters the "Red" zone, these bottles tip slightly and pour "ketchup" onto the scoreboard in a unique special effect. Thumbs up from us! Another wonderful aspect of the seating area is the breathtaking view of the Pittsburgh skyline. Just like PNC Park, the view of this magnificent city can best be seen from the East sideline seating areas as well as from the rotundas in the open endzone and with this being Monday evening the sights of the city were amazing!!!! "Pittsburgh sideline store", offering Steelers souvenirs and merchandise were scattered throughout the stadium, the main one found, of course, in the "Great Hall". Pittsburgh food items are awesome, and just as at PNC Park, we have to again mention that great "Primanti Brothers" sandwich, offering a conconction of meat, cole slaw and french fries all slapped together on sourdough bread. Some of the locals suggested we check out the original Primanti deli in the Strip District to get a taste of the real thing. Great advice.. we will head down there on a future visit! Besides Primantis, other local favorites include Benkovitz and Quaker Steak and Lube (wings) found in the Great Hall. Add the traditional ballpark fare, and you have a great mix here. Outstanding! While no banners or numbers are displayed in the seating bowl itself, the Steelers more than make up for this in their elaborate historical presentation in the "Great Hall". Five Super Bowl appearances - four championships, and tributes to the Steelers greats - Rooney, McNally, Layne, Stautner, Greene, Ham, Blount, Bradshaw, Harris, Lambert, Noll, Webster, Swann, among others, all displayed in this stadium for all eternity. Awesome, awesome, awesome! Touchdown - The Steelers "Great Hall", by far the nicest concourse in the NFL. Hey Tampa Bay, Pirate ship is OUT; Great Hall is IN! Yo Ho! Fumble - tight seats. Our seats were 50 yard line upper deck, and while leg room was adequate, the shoulder space was very tight. OK, OK, spend more time on the treadmill and less time at the Primantis stand... message received! Fumble - single ticket sales. Tickets are in high demand here, and only about 2500 tickets are available to the single ticket buyer. In this day and age of technology and the internet, the Steelers still do things like it's the 60's, send in a check and a self addressed stamped envelope after so and so date with your game request. We struck out via this route, and went elsewhere in search of precious tickets. Extra Point - as in FedEx Field, they also trucked out "Lovin You", but that music clip blended right into "Who Let the Dogs Out". Apparently that goofy stadium worker in the VISA ad finally got a hold of the track. Of course the fans ate it up. With the pummeling that Kordell and the Steelers put onto the Titans on this night, everyone was in a pretty festive mood. Touchdown - Throughout the stadium at each entrance to the seating area is a unique ceramic tiled football mural by the children of Pittsburgh and Western Pennsylvania. Each mural is identified by the name and location of the contributing school. Very well done! Extra Point - HERE WE GO STEELERS, HERE WE GO!!! The Steelers pummeled the Oilers...errr...Titans on this night by a 34-7 count and it wasn't that close. Coupled with the 'Skins victory over the Giants on the previous day, the win gave the roadtrippers a three game win streak for the home teams and six of the last seven overall. Next stop, Invesco Field at Mile High....bad news for all of you Flutie freaks out there!!! Thank you goes to Diane Lambert of Trenton, New Jersey, Steelers season ticket holder, who worked out a trade with us (2 Bills tickets for 2 Steeler tickets) and that is how we got into the building on this night. Diane even went to the trouble of contacting friends to upgrade the tickets and get us a better view. Hey Diane - great seats! Thank you and we induct you into the Ultimate Sports Road Trip Hall of Fame. Thanks also to the numerous friendly Pittsburgh fans who invited us to join their tailgate as we walked around, handing us a cold IC Light and offering us food, conversation and some friendly Buff vs Pitt banter (Darius Kasparaitis, game 7... Flutie... on and on). It was all good fun! As is the case with their companion facility - Pittsburgh's PNC Park, the folks here in Pittsburgh went to great lengths to build a stadium which is beautiful, functional, pays great attention to detail, blends in with the surroundings, and showcases their proud traditions and history. Heinz Field is all that and more - this stadium takes advantage of its location near the river, its proximity to downtown, and blends these into their building to provide sweeping vistas from inside and out. Add the size and width of common areas, the decor, the architecture, the extra touches and the amenities, and that adds to the score. Lastly, those great Steelers fans, blue collar, gritty, so proud of their football team and so cognizant of their great legacy and traditions. They just love their Steelers and they let you know it. You know what's coming... as we described this venue to you we could not contain our enthusiasm. Without a doubt, Heinz Field ranks right up there among the NFL's elite. And combined with PNC Park, this area surpasses Baltimore and KC as the finest dual Stadium complex in pro sports. (Though D-town may provide some tough competition when Ford Field opens next September). We are proud to once again bestow our highest rating to the City of Pittsburgh... nice job! The Pittsburgh Steelers will add 700 new seats to Heinz Field for next season. The seats will be in the venue's club section. In addition to the seats, a new club section will include 20,000 square feet of enclosed space for ticket holders to use to escape the elements. The project, estimated at $4 million, will increase Heinz Field capacity to 65,050. The Steelers will offer the new seats to fans on the season ticket waiting list and to existing season ticket holders who have asked to be relocated to club seating. Prices for the club seats next season will range from $153 to $206 per game, increases of 2.68% to 3%, respectively from last season. There will be no increase in any other seat prices. The Cordish Co. of Baltimore and Continental Real Estate Cos. are acquiring land between Heinz Field and PNC Park in Pittsburgh for a new entertainment district. Cordish hopes to build one of its signature urban �Live" districts, which can be found in Louisville, Kansas City, Baltimore and elsewhere. "Power Plant Live!" in Baltimore and "4th Street Live!" in Louisville feature shops, clubs, restaurants and bars, many of which are chain or franchise outlets and can already be found in Pittsburgh. Pittsburgh, Pa. - The Stadium Authority has completed the sale of the second of two prime pieces of North Shore property, where the Pittsburgh Steelers plan to build a 178-room Hyatt Place hotel and a companion year-round entertainment complex. Continental Real Estate Cos., through an affiliated limited partnership, paid $1.32 million to purchase the 2.185-acre site targeted for the hotel, according to deed documents filed in Allegheny County. In November, the authority completed a $1.38 million sale of an adjoining 3.96-acre site for the entertainment complex to PSSI Stadium Corp., which manages Heinz Field. The Columbus-based developer is working with the Steelers and Pirates to develop property between Heinz Field and PNC Park. Site preparation in advance of construction of the seven-story, $27 million hotel will begin in February or March, depending on the weather, said Barry Ford, president of development for Continental. According to the timetable, the hotel likely would open in the spring of 2010. Continental is teaming with joint-venture partner RockBridge Capital LLC of Columbus in developing the project. The company's Continental Building Systems construction unit will build the facility. The entertainment complex still is moving through the design and planning process, Ford said. A timetable for construction is not yet available. The Steelers plan to develop an indoor/outdoor venue that would operate year-round. It would seat 5,000 people outdoors and 2,000 indoors. Pittsburgh, Pa. - The Pittsburgh Steelers have started work on a $12 million project next to Heinz Stadium that will include a 5,600-seat amphitheater. The team has been planning the entertainment district since before it opened the stadium in 2001. The Steelers worked with several developers on plans that never came to fruition, lost almost half of the state funding for the project, and battled some Stadium Authority board members and community activists over the price of the land and a benefits agreement for the North Side. In the end, the Steelers partnered with Continental Real Estate Cos., the Columbus firm developing the land between Heinz Field and PNC Park, to get the deal done. The complex will be built to host both indoor and outdoor concerts and events. The Steelers and Continental hope to have the outdoor side finished for the start of football season in September. The indoor part probably won't be ready until late October. The complex will be able to hold as many as 2,500 people for indoor concerts that won't offer seating. Capacity will be lower for shows with seating. There will be room for as many as 5,000 outdoors. Continental and the Steelers are hoping to attract as many as 100 events a year to the venue to make the North Shore more of a year-round destination. The two will co-own the complex. Pittsburgh, Pa. - The Steelers may add more seats to Heinz Field, a move that would help address the seemingly insatiable demand for tickets, but could worsen the parking crunch in the steadily developing North Shore, the Pittsburgh Post-Gazette reported. In part because of the potential additions, the Stadium Authority voted to spend $20,000 to study the parking situation on the North Shore. Steelers co-owner and President Art Rooney II told authority officials that the team is studying whether Heinz Field's 65,000-person capacity could be expanded by several thousand. "It's probably somewhere between 2,500 and 4,000 [additional seats], and it would be in the south end zone," he said. That is the open side of Heinz Field, where the scoreboard sits, and he said the seats could be added without changing the footprint of the stadium. "Since we moved into Heinz Field, obviously we've been studying the demand for tickets," he said. "We feel satisfied at this point that there's certainly enough demand to consider expanding capacity." If seating is added, it would "definitely be some general seating, reserve seating and possibly some club seating," Rooney said. The Steelers lease of the stadium, owned by the joint city-county Sports & Exhibition Authority, contemplates additions. This one would be privately funded, though some revenue from a surcharge on tickets could conceivably be used. An option agreement between the Pittsburgh Stadium Authority and the Steelers and Pirates regarding development between the North Shore stadiums will be put on hold for six months pending a study of parking needs, the Pittsburgh Post-Gazette reported. The decision by the Pittsburgh Stadium Authority will allow additional time to study the need and impact of parking in the area. Pittsburgh, Pa. - The Steelers, the Pirates and the city's Stadium Authority have finalized a deal that gives the teams more time to develop the land between Heinz Field and PNC Park, the Pittsburgh Post-Gazette reported. All three parties signed the new agreement, nearly one month after stadium authority board members voted unanimously to amend a 9-year-old option agreement and to extend the deadlines the teams had missed for developing property on the North Shore. In voting to amend the agreement, the board, in essence, rejected a proposal by Pittsburgh parking magnate Merrill Stabile to build a 10-story "signature office tower" on a 3.3-acre tract next to Stage AE. Under the new deal, the Steelers, the Pirates and their development partner, Continental Real Estate Cos., will have until Dec. 31, 2012, to start development on the front half of the same parcel. They must submit a full site improvement plan for the development by July 2012. The teams must start development of another property, either one next to the Equitable Building or along Mazeroski Way, by May 31, 2015, followed by another on May 31, 2017. To date, the Steelers, Pirates and Continental have developed four parcels on the North Shore. Under the original agreement, they should have had nine completed by now, exclusive of any automatic extensions allowed under the document. While getting more time to do development under the new agreement, the newspaper said the teams also will be required to pay fair market value for the land, as determined by appraisals. Under the old deal, they paid anywhere from $5 to $15 a square foot. Stabile estimated that the land is worth anywhere from $60 to $100 a square foot. He said he sold a tract for a hotel development near PNC Park for more than $100 a square foot. The 3.3 acres Stabile offered to pay $10 million for would have gone to the teams for $1.3 million under the old agreement. Pittsburgh, Pa. - The Steelers are formulating a game plan to add 3,000 seats to Heinz Field in time for the 2013 football season, according to the Pittsburgh Post Gazette. At the request of the team, the city-Allegheny County Sports & Exhibition Authority board approved a resolution to further explore and discuss the scope, design, timing and funding for the additions. SEA executive director Mary Conturo said the authorization was needed so that the team could take its proposal for the new seats to the National Football League for approval, possibly in May. All seats would be added in the stadium's south end zone near the scoreboard. Mark Hart, the Steelers' director of strategic planning and development, said the team hopes to start construction of the new seats after the upcoming season and have them completed by August 2013. The club hopes to begin marketing the seats for sale sometime this summer after it has obtained the necessary approvals and devised a plan to fund the project, estimated at $30 million to $35 million. Heinz Field has "been a catalyst for development around the North Shore. This is really the next phase in maintaining Heinz Field as a world-class facility," Hart said. "We look forward to working with the SEA in improving Heinz Field and increasing its capacity." 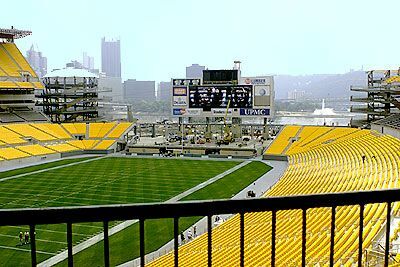 The stadium currently seats 65,050 people and routinely sells out for Steelers games. As part of the new project, the Steelers plan to raise the plaza at the south end of the stadium, build a club level and revise the entry gates. Hart said the team is limited by the design and architecture in that end zone to adding no more than 3,000 seats. "If we could fit in more seats, we certainly would like to do that. If, at some point in the future, we figure out a way to do it, we will do it," he said. While the team has yet to decide how to pay for construction of the new seats, possible sources could include revenue from a surcharge on tickets. The Steelers also may sell personal seat licenses, a fee a fan plays for the right to buy season tickets, as a means of raising money. Pricing for the seats has not yet been determined. "I think personal seat licenses will certainly be part of the funding mix," Hart said. The team raised an estimated $40 million through the sale of personal seat licenses before Heinz Field opened in 2001 and used the money toward its $123 million share of the stadium's $281 million cost. Many of those licenses, which are owned by the fans who purchase them, have soared in value because of the popularity of the team and the demand for tickets.